A snappy and creative brand name created for medical, fitness, and health industry. This creative business name will be the world’s leading production business that would help users achieve a healthier and happier life. A great company name to bring you to success. This cool business name is a playful creation which could be associated with the word “savviest”, this is a remarkable brand name that fits internet, fun, entertainment, technology and mobile application. An absolute hit to users worldwide, this will be the best! A fantastic and trendy 4-letter brand name which is a perfect fit to any electronic-business site or application. It will surely stand out from the rest of its competitors in employment, internet, technology, and business sector. Will be loved by millions! An epic 4-letter business name that is terrific and awesome, it is an outstanding choice for online sales, real estate, internet, and marketing business. This cool brand name would really open opportunities to you and expect a lot of users loving it! A smart combination coming from the words “SEO” and “follow”, this is a cool brand name to be used for SEO, SMO, SEM and SMM ranking and marketing that will surely obtain the maximum potential in website traffic. Truly, this catchy business name will stand out! An attractive business name forged using the words “carry” and “works”, this cool brand name is a trendy pick for a logistics company. Also perfect for marketing services, internet, sales, and financial sector. People will love this catchy brand name, this is a must-have! A charming creation derived from the words “elect” and “works”, this cool business name is an optimal choice for a tech production and services company related to laptops, computers and mobile phones. A unique brand name that will surely bring you to the top! The smart and creative business name created from the words “cheat” and “works” is a truly magnificent and could be associated with the video game, entertainment, business and internet hacks and tricks that will be adored by gamers worldwide. A great choice to boost your success! A dynamic and catchy business name created from the words “fixed” and “works”, this is a delightful option to be used in construction, business, sales, marketing, and home repair services. It is going to be remembered by people all around the globe. 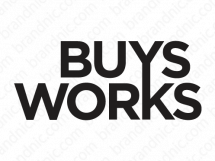 A breathtaking and creative brand name crafted using the words “busy” and “works”, this cool business name is an excellent choice for business and marketing company indulging primarily in investments and consultation. Certainly, going to be an absolute success in the industry. A cool creation from the word “copy”, this creative business name is an outstanding option for a software or application that copies and archives computer data. A smart brand name for users in sales, product, product and mobile sector, this is an opportunity waiting to be unwrapped! This cool brand name is a witty innovation from the word “smart” and “loose”, this will be the trend-setter in the field of health, fitness construction and design. A catchy company name that users will always remember! A perky reinvention of the words “smart” and “modify”, this cool brand name is a suitable choice for a construction, real estate, game, and design business. The awesome business name is a blockbuster to all users out there! This exquisite and trendy brand name is taken from the words “smart” and “modify”, this is an ideal business name for an automobile, construction, art and design business that is certain to hit all forms of renovations with a bang! This trendy business name is composed of the words “smart” and “fixed”, this groovy and catchy brand name is an outstanding pick for services, internet, business, and marketing company providing smart solutions to their customers. The users will certainly love this company name! The superb remake of the words “identify” and “pro”, it is a suitable and catchy brand name to be used in security, internet, business, marketing and network that will definitely give its users a fun and safe experience. Users will adore this business name!